Over the past two decades, inflammation has emerged as a factor that is involved in the process of CVD that commonly results in heart attacks and strokes. While the precise role inflammation plays indirectly causing chronic CVD remains an area of intense current investigation, much more is now known. And there is both good and bad news regarding the amount and type of fat in the body and its connection to CVD and periodontitis. First, the bad fat news: Animal fat mainly contains “bad” cholesterol, otherwise known as low-density lipoprotein (LDL), which can cause the accumulation of fat breakdown products within the arterial blood vessel walls. This process leads to an awful sounding condition, atherosclerosis (“athero” – plaque or film; “sclerosis” – hardening and narrowing of arteries). This is also initiated and accelerated by inflammation of the lining of the blood vessels and arteries. So now you can begin to see the potentially terrible connection between your immune system and diseases that have an inflammatory aspect in common. And, unfortunately, your immune system is not always protective. Inflammation can operate in all stages of CVD, from initiation to progression, and ultimately to complications like heart attacks and strokes, particularly in obese individuals. And the incidence of CVD complications increases in individuals with chronic inflammatory diseases. In addition to periodontitis, they include rheumatoid arthritis, infections of the respiratory (lungs) system, and infections of the urinary (kidney and bladder) tract. CVD leaves markers in the blood, which can be used to predict complications. For example, higher values of C – Reactive Protein (CRP), a blood marker of inflammation that can predict future heart attacks, unstable angina (chest pain on exertion), the onset of high blood pressure, diabetes, and even stroke. There are current and important strategies that work for preventing CVD, which are centered around reducing dietary fat and lowering LDL (bad) cholesterol with medication. A number of risk factors also relate closely to the development of CVD including age, gender, high blood pressure, diabetes, smoking and low levels of the “good” fat cholesterol, high-density lipoprotein (HDL). With a couple of notable exceptions, most of these factors can be modified by lifestyle changes to reduce risk and improve health. In addition, an individual's level of chronic inflammation can be monitored by a blood test for CRP and one's level of inflammation can be reduced by various actions. The most direct approaches to reducing chronic inflammation include reducing body weight, especially around your waist, kicking the smoking habit, getting regular moderate exercise, and controlling untreated inflammatory diseases such as periodontitis. 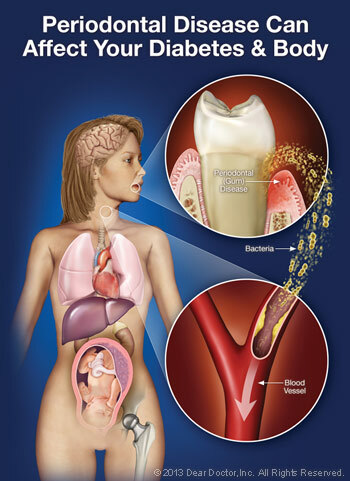 Moderate to severe periodontitis increases the level of systemic (bodily) inflammation – a characteristic of all chronic inflammatory diseases. Sufficient treatment of periodontitis to reduce clinical signs of the disease also decreases the level of systemic inflammation. In untreated periodontitis, the same bacterial strains that are commonly found in periodontal pockets surrounding diseased teeth have been found in blood vessel plaques of those with CVD. An indirect relationship has been shown between periodontitis and CVD, and many of the risk factors are shared in the two diseases. Cigarette smoking, especially, is common in determining the relative importance of risk in the relationship between the two. In addition to tobacco use, diabetes, obesity, systemic inflammation, high blood pressure, major depression, physical inactivity, family histories of CVD and periodontal disease, advancing age, and male gender are other commonalities to both diseases. And finally some great news! A great deal is known about the causes and successful treatment of inflammatory periodontal and cardiovascular diseases. While the mechanisms that link them are still the focus of ongoing research, their diagnosis and treatment individually and collectively can prolong your oral and general health. So, remember, united they stand, but divided they fall. Be sure to see your dental and medical health professionals to maintain your oral and general health and overall well-being.